The benefits of Roux-en-Y gastric bypass surgery including prevention of type 2 diabetes, hypertension, and dyslipidemia appear to persist over a decade, according to a study in the New England Journal of Medicine. Researchers studied over 400 people with severe obesity who underwent Roux-en-Y gastric bypass, 400 who sought the procedure but did not receive it, and 300 obese people who did not seek or undergo surgery. At 12 years, the surgery group had lost 27% of their body weight, compared with 1%–2% among patients who didn’t have surgery. The surgery group was also at lower risk for developing type 2 diabetes (3% vs. 26%), hypertension, and dyslipidemia. Of patients in the surgery group who had diabetes remission at 2 years, 69% were still free of diabetes by year 12.On average, after 12 years, patients weighed 77 pounds (35 kg) less than they did before the surgery, Adams and colleagues report in the New England Journal of Medicine. “This study further confirms the long-term durability of gastric bypass surgery,” chief author Dr. Ted Adams of Intermountain Healthcare in Salt Lake City, Utah, told Reuters Health by phone. “You have an intervention that, 12 years down the road, is helping people maintain a 27 percent weight loss,” said Dr. Jamy Ard, co-director of the Weight Management Center at Wake Forest Baptist Medical Center in Winston-Salem, North Carolina. Because some insurance plans don’t pay for the surgery, “we need to rethink what we will cover from an insurance standpoint,” said Ard, who was not involved in the study. All of the patients underwent Roux-en-Y gastric bypass, where surgeons close off all but an egg-size pouch of the stomach and then bypass part of the small intestine. Gastric bypass typically costs $20,000 to $30,000. Researchers compared 387 patients who had surgery with 378 volunteers who decided against it, typically because insurance would not cover it, and 303 other adults with severe obesity. The team had previously reported benefits of the surgery at the 2- and 6-year marks. The average starting weight was 295 pounds (134 kg). 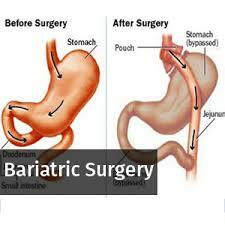 People who didn’t undergo surgery typically lost just 6 pounds (2.9 kg). While 26 percent of patients in the control groups had type 2 diabetes at the 12-year mark, the rate was a mere 3 percent with surgery. Remission was more likely when a diabetic was not taking insulin, probably because those patients still had enough healthy pancreas cells left to produce insulin. “The more advanced the type 2 diabetes, the less the glycemic benefit from Roux-en-Y gastric bypass,” the Adams team concluded. Blood markers for heart disease, such as bad cholesterol, collectively improved more with the surgery. The reduction in high blood pressure was significantly greater compared to one of the control groups but not the other. Most patients were female and white, so it’s not certain if the results apply as well to other groups. One troubling finding: there were five suicides in the surgery group and two among people who were not in that group but had bypass surgery outside the study. No people in the other control group took their own lives. “Whether the increase in suicides is attributable solely to bariatric surgery itself or whether any large, sustained weight loss would also be associated with an increased risk of suicide is unknown,” the researchers wrote. “It is concerning,” Adams said. “It doesn’t occur very often, but it has been enough that it raises a red flag. A number of groups are looking for the underlying reasons.” For example, rerouting the digestive system might affect how alcohol or mental health medications are metabolized. Ard of Wake Forest told Reuters Health by phone that the suicide question “highlights the need for comprehensive care” where a behavioral specialist is part of the team that can look for warning signs. “What we can learn from this paper is that we have a very effective treatment tool for severe obese patients with associated medical problems,” said Dr. Jaime Ponce, medical director for bariatric surgery at CHI Memorial Hospital in Chattanooga, Tennessee. “Also, it is important to see that patients that are not having ‘access’ to bariatric surgery, either because they don’t have specific insurance coverage or have not been educated, will suffer the consequences of remaining severely obese and deterioration of health and quality of life,” he told Reuters Health in an email. Because people with diabetes typically cost the health system an additional $7,000 per year, said Ard, “you don’t have to do a lot of surgeries to start saving money” if bypass prevents diabetes or puts it in remission. Fewer than 1 percent of eligible candidates get the surgery, said Ponce, who is past president of the American Society for Metabolic and Bariatric Surgery. For further reading log on to bit.ly/2wkPnkx The New England Journal of Medicine, online September 20, 2017.